While she was a freshman at the Halion VI Hairdresser Academy Ksenia was chosen by a cosmic force along with four fellow students. This cosmic force promised to unlock the hidden potential within each of them, and arranged for brightly-colored spandex suits of armor to be delivered to their student dorms. They were tasked with fighting evil monsters that threatened the galaxy, and boldly they faced their destiny. Sadly, the 'cosmic force' turned out to be some hacker kid that had been rejected from the academy a year earlier, and Ksenia's fellow chosen-ones were squished when a 20-story tall monster waltzed into town. Ksenia still managed to defeat the monster on her own, and even though she never heard from the 'cosmic force' again after that, she continued to hunt down giant monsters as a part-time job during her time at the academy. 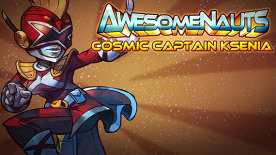 This DLC contains a custom skin for Ksenia in Awesomenauts! If you have not unlocked the character yet, purchasing this content will do so.